They're re-doing the entire street level facade of the Milford Plaza, and looks like they're doing some nice restoration work of old details that were hidden away. The Milford Plaza building should be landmarked. I really believe an observation tower/hotel/entertainment use would work well here. There are stellar views of many major landmarks at +1,000 feet, plus the birds-eye view of Times Square would be incredible. Maybe even some kind of ride at the top. 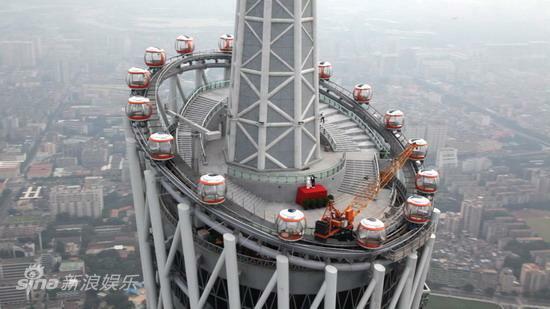 Maybe a bit more exciting than Canton Tower's though. ....Not to be outdone, Gary Barnett, the prolific developer who is building one of the tallest residential skyscrapers in the world, on West 57th Street near Broadway, said that he too has considered getting into the observation-deck business. Are you suggesting that this tower can be 1,000'? If do, that would be nice. Any news regarding this site? I can't think of another lot like this in such a high traffic area that has yet to be built on. Almost all buildings that stalled after the 2008 financial collapse have since resumed construction except this one. It's great that an arts alliance has temporarily taken up shop though. Extell owns it, and plans residential or residential/hotel. Given everything Extell has on their plate, I'm not surprised this site isn't being developed at this moment. I would guess something very tall and thin will rise at some point. Would not be surprised if we got a supertall or something similar on this site. Just fyi - the assemblage Of tiny little “temporary” booths selling clothes and handbags and accessories - that have been at the SE corner of 46th and 8th - are finally gone. I wonder if that means ground is about to be broken on this building site? Anybody have any updates RE 740 8th ave?